Tight margins are the norm for matches in this league and Saturdays was no exception with a single Josh Todd goal proving to be the only difference between the teams, Montrose were more than a match for Annan and statistically possibly had more shots on target than Annan but the difference between the teams was that Montrose never really tested Kenny Arthur in the Annan goal or carried a threat up front which was liable to prize open a solid Annan defence . The main difference between the teams was the quality Annan had up front . Annans front pairing of Josh Todd and Scott Davidson carried the threat in the last third and in Andy Mitchell Annan had the quality on the right hand side that prized open the Montrose rearguard to set up Josh Todd with the simplist of goals in the 47th minute. Two weeks ago Annan were in a similar situation when they found themselves defending a single goal lead, on that occasion Stirling scored right at the death to deny Annan victory and this game had similar tones towards the end of the game as Montrose went all out at the death to cancel out Annan’s goal advantage but on this occasion Annan stood firm to win the points that ensures Annan’s play off hopes are still very much a reality. The wind and rain no doubt was a big factor in ensuring that the quality of football on show was not top class and the opening 45 minutes was frustrating for both teams with scoring opportunities few and far between. Andy Mitchell set up Todd in the 25th minute with the shot from the edge of the box flashing past the post. Callum Ferguson’s header in the 31st minute went over the bar for the visitors. The best and only move of class in the first half almost paid dividends for Annan when Todd and Brannon combined to set up Scott Davidson who’s shot cannoned off the base of the post in the 37th minute. Montrose threatened towards the end of the half and Paul Watson’s 44th minute effort was the nearest they came to scoring but the shot sailed over the bar. 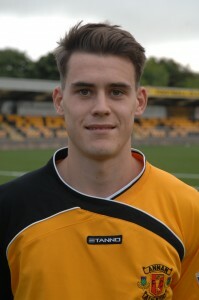 Annan started the second half positively when Todd’s header from a Mitchell free kick went narrowly past the post but almost immediately from the resulting goal kick Brannon picked the ball up linked with Davidson who slipped the ball to Mitchell who hit the bye line finishing with a low cross to the advancing Todd who managed to slip the ball under the keeper and into the net from 4 yards. The goal spurred Annan into more action and shots from Todd and Bradley were not enough to trouble Stuart McKenzie in the Montrose ‘s goal. Kieran Brannan had a golden opportunity in the 71st minute when Badley’s free kick eluded everybody to end up at the feet of Brannon who failed to take advantage of the opening. The introduction of McCord and Sturrock had a positive impact on Montrose who started to push the ball about with confidence but it was Annan who looked the more dangerous epitomised by a swift move from defence ending with substitute Dan Orsi forcing keeper McKenzie to make a save low down. Deep into injury time Bryan Deasley squandered a great opportunity when he shot over the bar after a long ball eluded everybody and fell invitingly for Deasley. The most glaring miss however fell to Annan’s Matty Flynn after Scott Davidson went clean through on goal and unselfishly squared to the unmarked Flynn who blasted wide and high. Annan Athletic – K Arthur, S Sloan, M McNiff, S Black, S Swinglehurst, , M Flynn , S Davidson, K Brannon( D Orsi 79 min) A Mitchell, J Todd, P Bradley . Substitutes not used Z Caldwell, I Chisholm, C Jardine, J Moffat, D Wood, A Mitchell. Montrose – S McKenzie, J Crawford, R McIntosh, A Campbell, G Wood, G Webster, S Johnston,P Watson, C Ferguson (R McCord 67 min), B Deasley, J Reid (K Sturrock 76 min). Substitutes not used D Gray, C Wilson, C Duiguid, L Bonar, J McCafferty.